In San Pedro Ambergris Caye, the Town Council is taking action to curb the rising gun violence on the island. In a release issued today, the Council states that it has been meeting with the Police to chart a course of action to reduce tensions between rival groups on the island. The Council states that the Ministry of National Security has given its reassurance that the Government of Belize will quote, “do whatever it takes to re-establish a sense of security on the island,” end quote. Further meetings are scheduled with Minister of Tourism and Civil Aviation Manuel Heredia, the Minister of State for Home Affairs, Elodio Aragon Jr., and senior personnel from the Police Department. The San Pedro Town Council and the Office of the Mayor expresses concern over the recent shootings on the island. Over the past few days, the council has been meeting with representatives of the police department and a follow up meeting is scheduled for the weekend. It is our hope, that following this meeting, a course of action will be taken to help reduce tension between rival groups, that has contributed to the recent shooting. The Ministry of National Security has given the council the reassurance, that the Government of Belize will do whatever it takes. to re-establish a sense of security on the island for our citizenry and visitors. The council will be meeting vvith the Area Representative and Minister of Tourism and Civil Aviation Hon. Manuel Heredia, the Minister with responsibility of Police (Home Affairs) Hon. Elodio Aragon Jr., and Senior Personnel from the Police Department, to establish what those measures will be. Following these meetings, with our local law enforcement officers on the island, we strongly say that the two recent murders are suspected to be fueled by gangs spin-off from Belize City, who are finding new avenues to control the drug trade in Belize. Therefore, the council joins the police in appealing to the community that if they know or have any information that can assist in the investigation, to kindly call the nearest Police station. The council re-mains steadfast in assisting the police department in their crime fighting measures. As such, the council wishes to inform the public that the SPTC has and continues to provide assistance to our local authorities with vehicles, housing and appliances on a continuous basis. The SPTC and the Mayor take the opportunity to sympathize with those families and friends affected by the recent shootings. The council is asking the public’s cooperation in assisting the police towards fighting crime. Crime is everybody’s business. On Saturday, January 27th, 2018, representatives from the Belize Police Department, Ministry of Home Affairs, and elected officials from San Pedro Town met in San Pedro, Ambergris Caye to discuss the recent shootings and to re-strategize their plan of action for the island. Present at the meeting were Minister of Tourism & Civil Aviation and Area Representative of Belize Rural South, Hon. Manuel Heredia Jr.; Mayor Daniel Guerrero, Deputy Mayor Gary Greif, Councilor Gabriel Nunez Sr., CEO in the Ministry of Home Affairs (Ret’d) Col. George Lovell, Commissioner of Police Mr. Allen Whylie, Assistant Commissioner of Police Mr. Edward Broaster, and the Officer Commanding the Coastal Executive Unit (San Pedro) Superintendent of Police Mr. Henry Jemmott. 6. Implementing a boat passenger manifest at all port of entries within the next three months. Specific tasks have been assigned to the various entities represented at the meeting. While a few of the steps taken will be immediate, some actions will require additional time for implementation; therefore, the public’s support is vital to ensure maximum success. 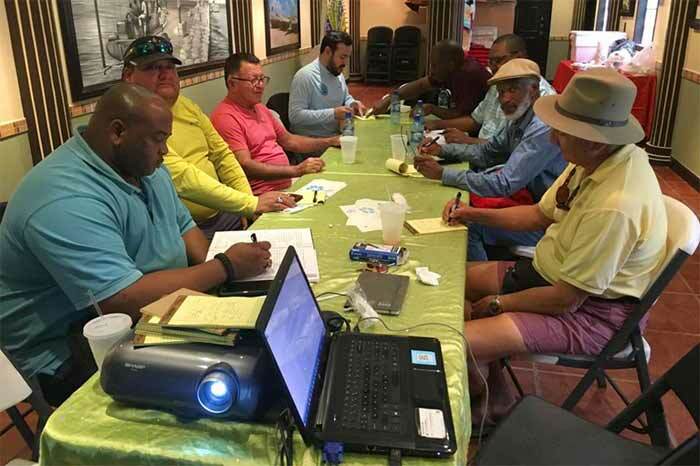 The San Pedro Town Council and the Police Department continue to encourage members of the public to get involved in neighbourhood watch groups in their respective communities and to report any suspicious activity in their areas.